An ancient form of travelling and exercise, snowshoeing has been around for 6,000 years. It is an environmentally friendly way to enjoy the beauty of nature in the wintertime. 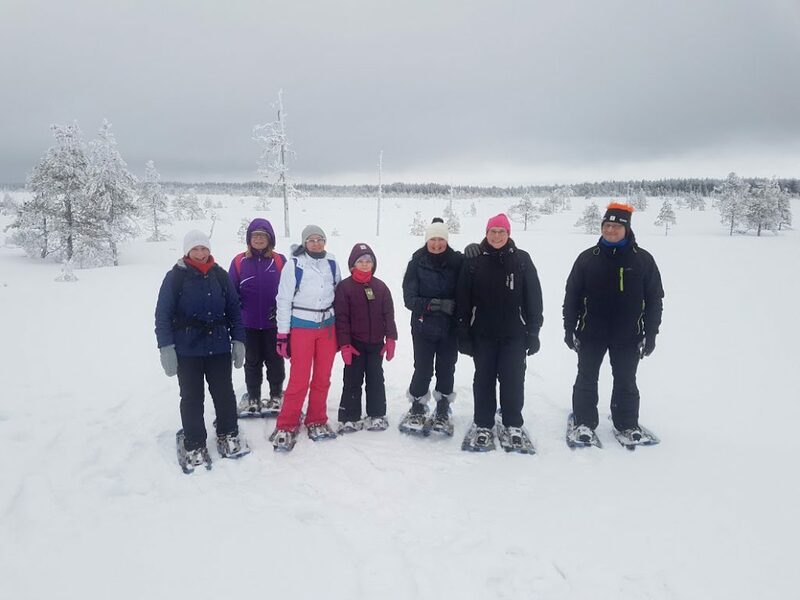 Snowshoeing is easy, fun, and suitable for people of all ages, regardless of one’s physical conditioning. Kipinäkota provides you with guided tours and excursions. In case you prefer heading out into the wilderness by yourself, our equipment may also be rented. Not familiar with snowshoeing? Learn the technique and enjoy nature on a guided tour tailored for first-timers. You choose the starting point of the tour, depending on what interests you the most: peaceful, frosted-over bogs; the endless beauty of a wide-open, frozen lake; or the hills embracing Europe’s largest crater lake. Nature in the winter is magical: under the frozen layers of snow, life persists. On our tour we may come across the habitats and tracks of various galliformes, including the wood grouse, or birds of pray, like the osprey. Your tour is tailored to meet the needs and interests of your group. Please note: Wear weather-appropriate clothing. Ask for safari gear beforehand – we can equip up to 15 people. Price includes: High-quality Tubbs snowshoes, guide’s services, open-fire coffee with a warm pastry. A snowshoeing tour at night is unforgettable. See thousands of stars, the moon, and with some luck, the northern lights. If the weather is cloudy, we can hone in on our sights with the help of head lights. You have never experienced nature quite like this! At an open fire, we will prepare coffee and sweet pastries. The atmosphere is magical, sitting at the fire in the dark. The tour will accommodate the needs and the interests of the group: we can choose to trek on the frozen crater lake or on the bog, or we can climb up on one of Southern Ostrobothia’s hills. Please note: Wear weather-appropriate clothing. Ask for safari gear beforehand, we can equip up to 15 people. Price includes: High-quality Tubbs snowshoes, head lights, guide’s services, open-fire coffee with a warm pastry. Snowshoes available for rent for independent travelers, click HERE.